We were just out for a walk in a park forest area thingy outside of London. It was sunny when we set out but while we were there the skies opened up! We booked it back to the car but the rain was so heavy that we couldn't get into the car. I managed to open one door and the foot well of the car had a puddle in it within about 2 seconds. Then BOOM it was like someone poured a bucket of water on us and we had to duck behind the car while a sheet of rain just came at us. We got applet in his seat and got the hell out, but roads we had been on just an hour before that were dry were suddenly flooded out. 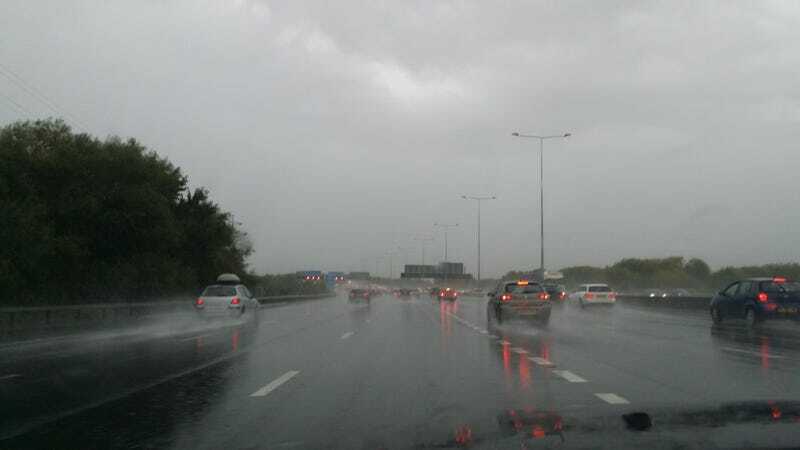 On the motorway now and it's a mess out there. Not sure if you can tell from the pic how heavy the rain is. I really hope we're not in for another year of flooding in the Thames Valley.